Your credit score is a valuable tool used for important financial decisions that affect your future. You may not even realize how it impacts your life until you are in the market for a home loan, car loan, or credit card. If you've been denied for any of these, it may be the result of a low credit score. Understanding your credit report at first may be difficult, but you must know the ins and outs of credit repair before you can improve your credit. Credit repair essentially comes down to removing inaccurate and unverifiable items from your credit report. This process does not happen overnight and usually takes several months to years for most consumers to see the full changes. However, once your credit score has improved, you can be eligible for benefits like credit cards with rewards, higher credit limits, lower interest rates, and car loan or mortgage approvals. Simply put, your credit score is a number that shows potential lenders how reliable you are at paying back your debts and allows them to choose if -- and how much -- credit they extend to you. These scores are provided by a third party. They are not determined by lenders like your bank or credit union and have nothing to do with your income and line of work. The credit scores that are most commonly used are the FICO® scores from the three major credit bureaus: Experian, Equifax, and TransUnion. Although each score may vary slightly, they should all fall in a similar range. Credit scores help banks and credit unions decide if they will approve you for a mortgage and what kind of interest rates you will have to pay. Your credit scores are occasionally used by companies when hiring new employees since steady payments show employers your dependability. A high credit score lets you receive lower interest rates on loans. A good credit score helps when renting an apartment or home since it may lower your initial deposit. What you pay for your cell phone bill may also be related to your credit score. Your credit report shows lenders your total debt, debt to income ratio, type of loan, debt history, and derogatory marks. Creditors report your financial information to the three major bureaus -- sometimes all three bureaus or sometimes only one. All of this information is put through a scoring model that generates your credit score. There are hundreds of scoring models, although the most commonly used ones are FICO® and VantageScore. Payment history: The largest factor in determining your credit score is how reliable you are at paying off your debt, which accounts for 35% of your credit score. The amount you have paid monthly for each of your debts appear in comparison to the monthly total. Any late payments listed show how late they were (30 to 150 days) and can stay on your credit report for up to 7 years. The later your payment, the more your credit score drops. Total debt: Your total amount of debt makes up 30% of your FICO® score. Debts like your credit cards are weighed more heavily than mortgages and student loans and your credit utilization (how much debt you owe compared to your credit line) also factors into your score. The more available credit you have, the better your score. Length of your credit history: The longer your credit accounts such as loans and credit cards have been open, the higher your credit score will be. In general, you want to keep your accounts open since your credit history makes up 15% of your credit score and shows creditors and lenders that you have a reliable history of paying back your loans. New credit lines: 10% of your credit score consists of inquiries, which is when you put in a new credit application. Each inquiry takes off around 5 points unless there were multiple inquiries in the same time period, which simply shows that you were looking for a new credit card or loan. Types of credit: 10% of your credit score is based on your different types of credit. Revolving credit like credit cards or retail cards doesn't contribute to your score as much as installment loans, which may have a house or car attached to it and show creditors that you own something that you are more committed to paying off. Student loans are also viewed in a similar light since they show an investment for your potential earnings in the future, which in turn helps pay off debts. The FCRA outlines laws that protect consumers in regard to credit repair and informs you of your rights when working with credit bureaus, creditors, and collection agencies. This act allows you to receive one free copy of your credit report at www.annualcreditreport.com, although you may be eligible to receive more than one copy of your credit report in some states. You can also visit a credit monitoring site to receive your credit scores. The FCRA limits who can access your credit report by ensuring all inquiries have a purpose in order to ensure your score is not damaged by hard inquiries. Unauthorized inquiries can be removed, which may potentially boost your score by a few points. This act also limits bankruptcies, foreclosures, and other negative items so they only stay on your credit report for seven to ten years; however, unverifiable items can be disputed before the seven years are up. The FCRA ensures that if a dispute is filed with the credit bureaus, they must respond in thirty days. If a creditor violates the FCRA by not correcting any errors on your credit report, you may be eligible to receive $1,000 in damages. Credit card companies may offer consumers (both customers and non-customers) their FICO® scores for free. You can purchase your FICO® scores at www.myfico.com. Your VantageScore can be bought at their website www.vantagescore.com. Several banks and credit cards offer credit monitoring, although these scores may not be the most commonly used scores like FICO® or VantageScore. Websites like CreditKarma, Credit.com, Quizzle, Credit Sesame, or other credit monitoring companies may offer free scores or scores for a monthly fee. Some websites may not provide your FICO® score, but a score based on a similar credit model. If you are denied an application due to information in your credit report, you can receive a notice with the bureau’s contact information and have sixty days to contact the bureau for a free report. You have been the victim of identity theft or identity fraud. Checking your score authorizes a soft pull on your credit, which does not damage it. You can repair your credit on your own by disputing inaccurate items on your own or you can hire a credit repair company to do the legwork for you. Improving your credit by even a few points can make a huge difference and save you thousands in the long run. When you look through your credit report, you will find your personal information, any negative items, account information, and a list of credit inquiries. If any of your personal information (such as your name, address, previous addresses, phone number, Social Security number, and employer) is incorrect, it may indicate a simple error or something more serious like identity theft. Positive and neutral items stay on your credit score indefinitely while negative items stay on your credit report for up to seven years. If you habitually make good financial decisions, your credit score can only improve. Older items drop off after a certain amount of time, so disputing newer negative items from your credit report is more beneficial. Bankruptcies: Bankruptcies are taken off your credit report no later than ten years after they were filed. The time frame also depends on the type of bankruptcy that was filed, since Chapter 13 bankruptcies stay on your credit report for seven years while Chapter 7 bankruptcies stay on your credit report for ten years. Charge-offs: This occurs when debts are no longer collectible by creditors. Instead of the debts being past due, creditors eliminate them by selling it to a debt buyer, who then tries to collect the debt amount plus additional charges like interest and late fees. Of course, these debts should still be paid as soon as possible. Collections: These items affect your score more than other negative items since more recent debt accounts for a higher percentage of your credit score. Collections are more likely to have errors since debts are sold multiple times to collectors. Your accounts in collections show if the account is paid, unpaid, when the account was opened, and the balance. Items that show up on your credit report include medical bills, loans, and even smaller debts like unpaid parking tickets and gas or electric bills. Pay attention to the types of debt you are paying off. Medical debt does not impact your credit score as much as other debt, start by paying off non-medical debt. Do your best to make full payments since paying these debts off partially resets the start date of that item and results in it staying on your credit report longer. You can also negotiate with a collection agency to pay a lower amount than what you owe but you may have to report the lowered amount as income on your tax return, resulting in higher taxes and tax rates if it moves you to a different income bracket. Document everything. Keep a record of any payments you make in writing in case a collection agency accuses you of not having made any payments. If you are able to successfully dispute and remove these items, any accounts in collections may take one to two months before they are updated in your credit report. Public records: These serious, court-related items include bankruptcies, judgments, and tax liens. The information listed states the name, amount, date filed, and the payment status of the account. Foreclosures: These items also appear on your credit report for up to seven years. However, many consumers qualify for a mortgage around two years after getting their finances together. Judgments: These are also reported up to seven years after the lawsuit or until the statute of limitations has expired, which is usually shorter than seven years depending on state laws. Late Payments: Payments that are over thirty days late fall under this category, although some creditors will not report it until you owe the second payment. Late payments and delinquent accounts are reported for seven years after the final scheduled payment and your credit report shows exactly how late your accounts are. Repossessions: These are reported for up to seven years after they were initially listed. Consumers are still responsible for paying off any remaining debt. Tax Liens: Paid tax liens are reported from the date of payment for up to seven years. Due to federal law, unpaid tax liens are kept on your credit report indefinitely, although credit bureaus can remove them after ten years. Credit bureaus have thirty days to review and update any new information. Most credit accounts update monthly, but public records are much slower to update. Mail a certified letter to the bureau with the item you are disputing and the reason why. Write this in a professional and objective manner. Be sure to include your name, phone number, current address, and documentation of incorrect information by attaching a copy (make sure that you keep the original documentation). Keep a copy of the letter and the return receipt to ensure that the bureau received your dispute. Here is an example of a dispute letter from the Federal Trade Commission: https://www.consumer.ftc.gov/articles/0384-sample-letter-disputing-errors-your-credit-report. Each credit bureau has thirty days to respond. We don't recommend disputing online since this takes much longer. Continue monitoring your credit during this period to see which items drop off, which ones remain, and if these are accurately reported on your credit report. You may have to communicate with the credit bureaus and creditors to get the results you need. You may also call each individual bureau with their toll-free number to dispute. Due to the FCRA, negative items can only stay on your credit report for seven years. If the credit bureau violates this statute of limitations, consumers may be entitled to $1,000 in damages and legal fees. Credit repair companies have thirty days to respond to your dispute, which they will do in writing. If the disputes are successful, the item will be removed from your credit report and a new copy will be sent to you (and other creditors or employers who may have had your incorrect credit report information); if the disputes are not successful, the items will stay on your credit report. You may also amend your credit report with a statement about the dispute and have that statement forwarded to creditors and employers who accessed your credit report by paying an extra fee. As the negative items on your credit report age, they become less important and do not affect your score as much. Once seven years have passed (or ten years in the case of a Chapter 7 bankruptcy), that information drops from your credit reports. Monitor your credit: You can either access your free yearly credit report from annualcreditreport.com or sign up for a credit monitoring service that helps you spot suspicious activity like identity theft or identity fraud. Pay your bills on time: This one sounds obvious, but remember that a single late payment can cause your credit score to drop. To avoid this, sign up for autopay when you can. Stick to a budget: You do not want to rack up any debt by living beyond your means. Methodically pay off your debt: Because much of your credit score is based on debt utilization (how much of the available credit you are using), you want to pay off your credit cards and highest balances before taking care of loans like mortgages and car loans. Keep old accounts open: You should leave old credit accounts open since a long credit history boosts your credit score and shows creditors that you are reliable with your payments. Avoid opening too many new credit lines: Try not to apply for too many credit cards at once since these inquiries can lower your score by around five points. Consider applying for a store card or secured credit card: If you are unable to get approved for a good credit card, consider getting a secured credit card to build your credit. A secured credit card lets you put a refundable deposit equal to the credit line that essentially lets you pay out of pocket. These can be acquired at a bank or credit union and it shows creditors that you are working hard to improve your financial situation. The deposit covers any missed payments and the credit limit is the deposit minus annual fees. This card has high annual fees and high interest rates (around 15% to 23%). Although this helps your credit score, you should only use it until you can qualify for an unsecured card. Before you apply, make sure that you receive a refund in case you are denied for the card. You should also check that the bank allows credit increases, that they do not report the card as secured, and that they report to all three bureaus. While using these cards, keep your balance to about 10% of your credit line, do not use them for large purchases, and pay them off on time. You can also apply for a retail card at a department store (which is easier to get once you have boosted your score from a secured card) but ensures that you pay off the account every month since this has a much higher interest rate. Consider a credit builder loan: You can take out a credit-builder loan from a service like Self Lender. This is a loan secured by your personal funds and repaid every month. Once you have repaid the loan, your deposit becomes available to you again. Although you can’t use your loan funds, credit-builder loans show creditors and lenders that you are responsible with money. Avoid taking out loans with high interest: This includes payday loans, title loans, or other predatory lenders. Lower your credit utilization rate: The less available credit you use, the higher your credit score will be. Request a credit increase on your cards: This allows your current balance to be a smaller percent of your available credit. Ask a trusted friend or family member if you can become an authorized user on their credit card: Ensure that they have a strong credit history that shows reliability. There is always a risk to this method since negative items could affect you too if they suddenly stop making payments or use a large amount of credit. Likewise, if you use a large amount of credit and do not make your share of payments, you will damage their credit. Get a debt consolidation loan: This loan allows you to consolidate all your debt and then pay a monthly balance. If your credit card’s interest rates are high, you may save money on the monthly payments if you have a low loan rate and even if your monthly payments are not high, your credit score will still increase since installment loans boost your score more than revolving credit. Before committing to any of these loans, see what rates you can qualify for by shopping around for pre-approvals. If you have gone through the steps to work to better credit and you still need improvement, it may be time to enlist outside help. A reputable credit repair service knows the ins and outs and loopholes of credit repair. Free initial consultation: Most credit repair services offer free initial consultations and no sign-up necessary. Getting multiple consultations allows you to pick the company that is best for you. A reputable credit repair service will not guarantee that your credit score will improve. 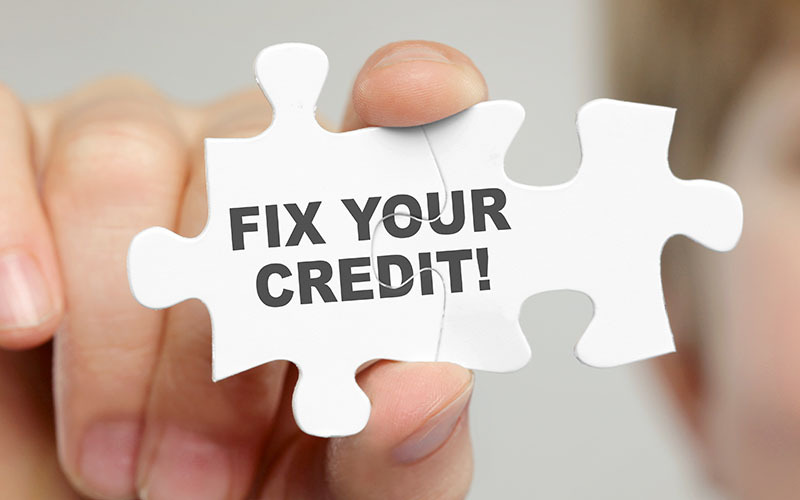 Credit repair companies cannot guarantee to fix every negative item on your report or repair your credit score overnight. Legitimate credit repair companies inform consumers of their right to repair their own credit if they are asked. They cannot tell you that you cannot repair your credit on your own or that you can't contact the bureaus yourself. When you receive your credit repair contract, you should receive a document that informs you of your rights. Scam artists may try to create a new credit identity for you by using a false Social Security number on credit applications. You should receive a contract that states the services, time frame, and how much you will pay. Consumers have three business days to cancel a contract from when it is signed. Credit repair is a great solution for those who are struggling with qualifying for loans, credit cards, and low interest rates. Although it takes time to reap the full benefits, you can save hundreds or thousands in the long run. Looking for a reputable credit repair service? Here are our top recommendations.